Ganymede is the largest (~5,200 km diameter) of the Jovian satellites. Surficial features on Ganymede, as recorded by the Voyager 1 and 2 spacecraft (Smith and others, 1979a; 1979b), indicate a complex history of crustal formation. Several episodes of crustal modification led to the formation of curvilinear systems of furrows in dark terrain, the emplacement of light materials, and the creation of grooves in light terrain. Prior to exploration of the Jovian system by spacecraft, Earth-based observations established that the surface of Ganymede is dominated by water ice with various admixtures of fine silicate (rock) material (Pilcher and others, 1972; Sill and Clark, 1982). No agreement yet exists as to the amount of water in the near surface material; early estimates based on spectral reflectance data suggested that half the surface was covered by nearly pure water ice, whereas later studies by Clark (1981) indicated that up to 95% of the surface could be water ice and still be consistent with spectroscopic data. The Pioneer encounters with the Jovian system in 1973 and 1974 confirmed that Ganymede was made up of patches of light and dark terrain but did not have the spatial resolution needed to determine the percent cover of water ice, or geologic relations of surface materials. Not until the Voyager encounters was the surface seen with sufficient detail to enable geologic mapping. 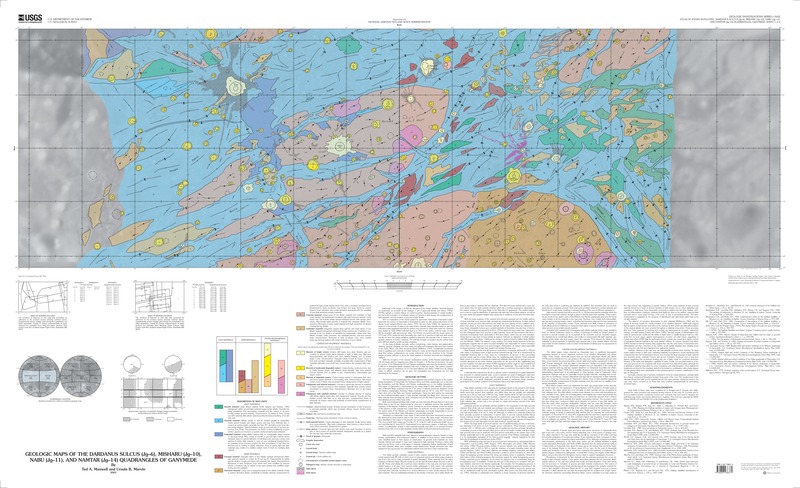 On the basis of albedo contrasts, surface morphology, crater density, and superposition relations, geologic mapping was done using principles and techniques that have been applied to the Earth, Moon, and other terrestrial planets (Wilhelms, 1972). Considerable uncertainty exists in applying such methods to bodies having icy crusts, as the internal processes that produce their surface configurations are poorly understood, and the resolution of the Voyager images is barely sufficient to show the detail required to interpret structural and stratigraphic relations. With the exception of the extreme southeastern portion of the Namtar quadrangle (Jg- 14), all images used for mapping were taken by Voyager 1. At the time of encounter, the eastern portion of the Misharu (Jgâ10) and Namtar quadrangles were near the terminator, making it difficult to distinguish albedo variations best seen at high sun angles. The western quadrangles were imaged at resolutions of 2â5 km/pixel (Batson and others, 1980) from an oblique angle, so albedo variations can be seen, but topography and morphology are not well expressed in the images.